Good food, good times, good art and music. 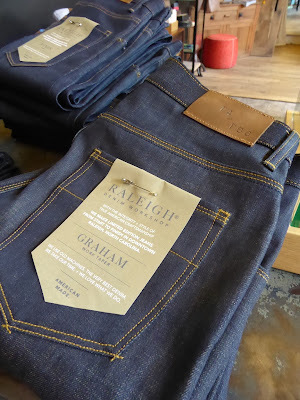 Subtract misguided state legislation and Raleigh, NC, is a great place to visit. I was there for a four-day meeting this spring and began wishing for less meeting and more free time to explore, always a good sign. 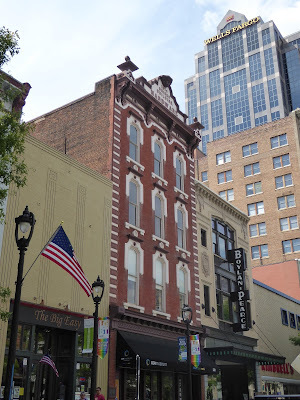 Downtown is particularly full of things to do, see and hear. It gets hot in the summer so start with a cold beer. Trust me, whatever your favorite brew, you will find it at Raleigh Beer Garden, where they claim to have the world's largest selection of draft beers; 135 at last count. Good bar food, too. Pedicabs dropped us off at DECO. Cooled down, you can either walk it off or treat yourself to a pedicab ride. The cheerful pedalers work for tips only and can take you to any of the following. A truly Contemporary Art Museum. CAM is a most unusual museum. 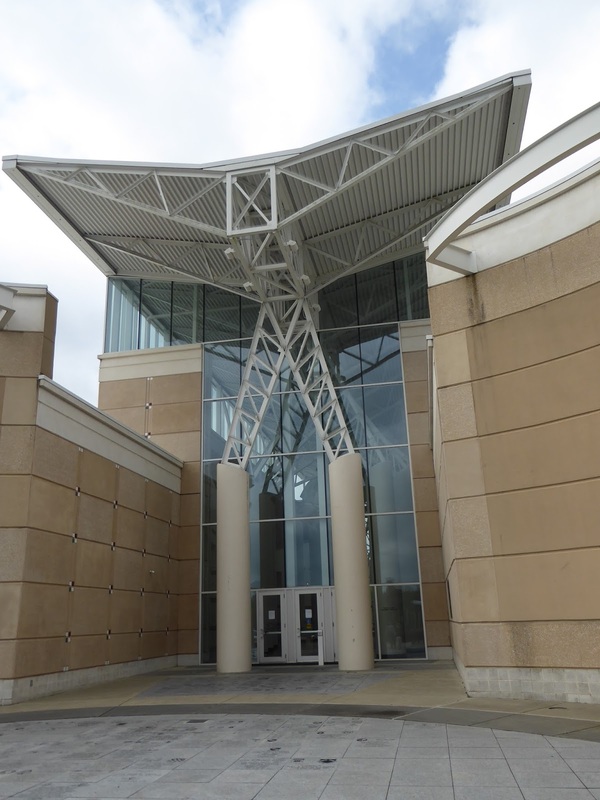 The Contemporary Art Museum has no collection of its own, rather it showcases a different exhibition of cutting edge work by an international cadre of artists every 16 weeks. The huge spaces at CAM are perfect for contemporary art. Admission is a nominal $5 but no one is ever turned away for lack of it. Do seek out a docent to introduce you to it all. Middle school students are taught to do just that, giving them public speaking skills and art education as well as hefty doses of self confidence. Tip: Use the elevator to go from ground floor to second. See what some of the area's best artists are creating at Art Space, a re-purposed 1911 livery and car dealership. Painters, fabric artists, sculptors, woodworkers, jewelers and potters find studio and exhibit space here while locals enjoy the classrooms for lessons. Tip: There is an elevator here, too. DECO's "parklet" with the only bench downtown. Deco is a unique shop well worth a visit with work by more than 60 local artisans and its own parklet complete with handsome bench. Open seven days a week, too. The North Carolina Symphony fills concert halls all over the state, but if they are home in the handsome concert hall downtown, take advantage of it and catch a performance. Also made in Raleigh are Holly Aiken's clever designer handbags, Cold off the Press Juice and Raleigh Denim's high-end ($300-plus) custom handmade jeans. Satisfy your sweet tooth at Videri Chocolate Factory, where Sam and Chris Ratto turned their dream into a delicious array of all tings chocolate. Beyond downtown is the must-see North Carolina Museum of Art. 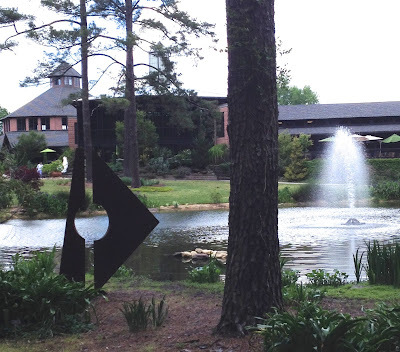 Situated amid a 164-acre park with sculpture, a theater and a separate building for special exhibits, it can easily entertain you for a day's outing. The history-spanning collection strong in pre- and Renaissance work of Giotto and Botticelli, not to mention the 29-statue Iris and B. Gerald Cantor collection of Rodins and 20th century modern and contemporary art. 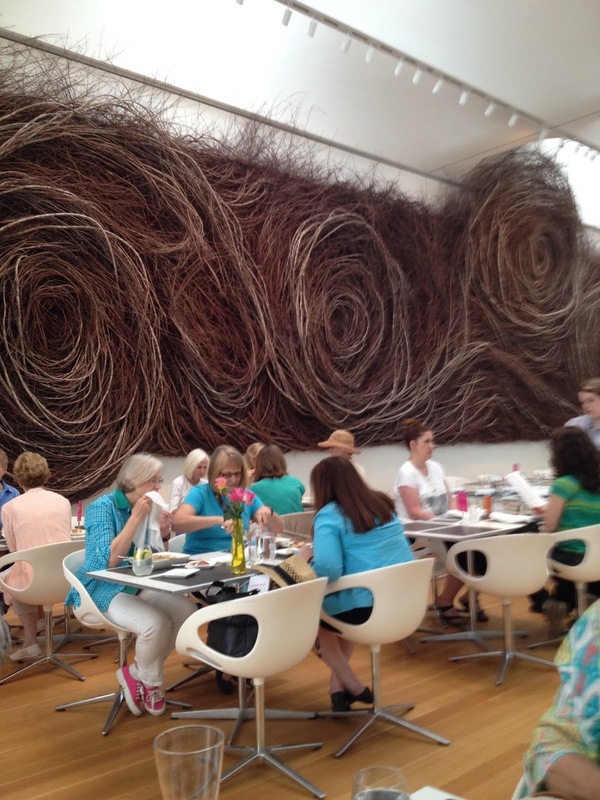 Time your visit for lunch at Iris, the museum's excellent restaurant. One of the best, most enjoyable meal I've had in a long time was at Iris. You won't go wrong ordering Moroccan fare at Babylon. Speaking of good meals, here's my favorite from Raleigh. 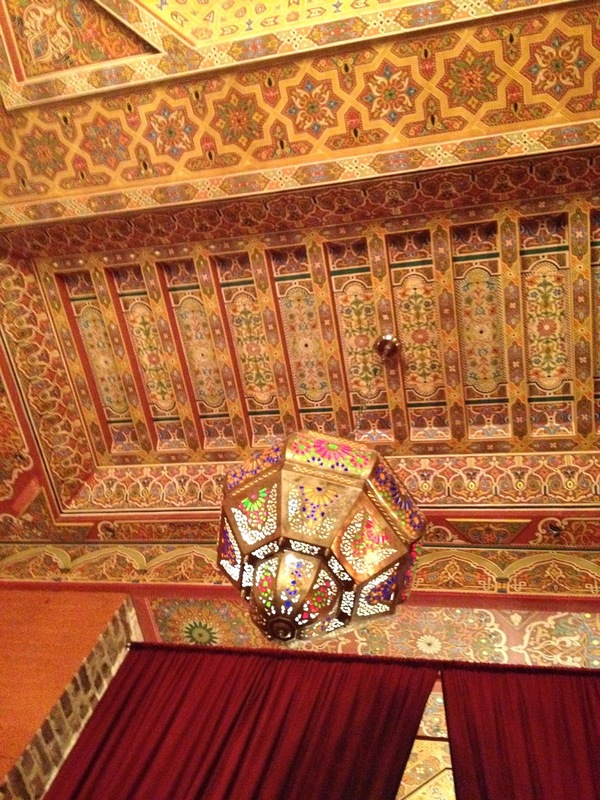 Babylon, a Moroccan restaurant from courtyard and pool to interior decor, thanks to its ebullient owner Samad Hachly and his long-time French chef John Paul Fontaine. 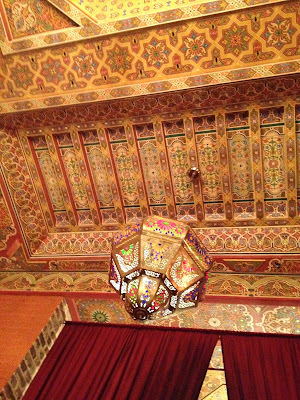 Even the ceilings are works of art at Babylon. Our jolly group was greeted by Samad, who orchestrated a memorable meal of Moroccan fare. Entrees run $14 and up, but splurge as we did for the Moroccan sampler at $45 per person; your taste buds will thank you. Dish after dish enriched the palate-pleasing flavors. Highly recommended. The Umstead Resort offers idyllic settings and view-worthy art. 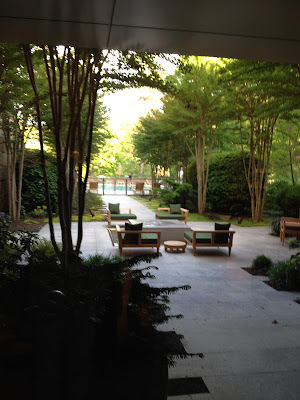 We were quite happy at the well-located Marriott but if you prefer a more resort feel, the upscale and elegant Umstead Resort and Spa is nearby in Cary. Levelers will find Raleigh an easy city to navigate with much to enjoy without undue stress. Levelers will like the gentle terrain around Fayetteville, NC. 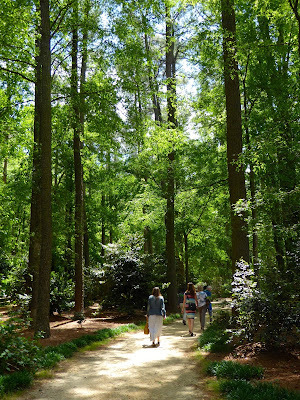 North Carolina is so filled with interesting destinations that many worthy stops are ignored. 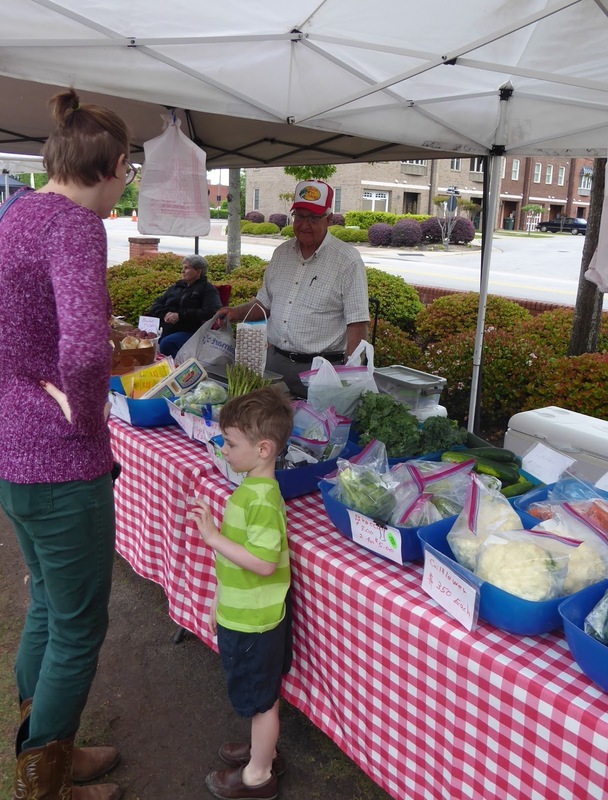 Fayetteville, in the state's Sandhills area, is one. Levelers will find its gentle elevation changes easy going. What are your interests? 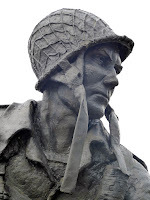 Patriots, the area's African-American or Gaelic history, adventure, antiquing, the Civil War, period architecture, historic markers, geo-caching, Lafayette, literature, transportation, arts and gardens, religious freedom or junque treasures? Each has its own trail described, pictured and mapped in a Fayetteville Area Convention & Visitors Bureau publication. The Saturday morning downtown crafts and farmers market outside of the Fayetteville Area Transportation & Local History Museum first drew our attention and checked off several trails' stops. 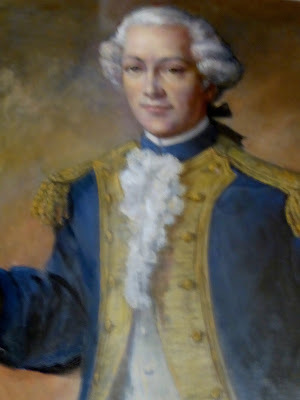 Fayetteville's namesake, the Marquis de Lafayette. After a bit of retail therapy outside, we entered to learn more about the city's connection to Marie Joseph Yves Roch Gilbert du Motier, Marquis de Lafayette. The town may be one of many in the USA named for him, but it has the distinction of being the only one actually visited by the French supporter of the American Revolution. 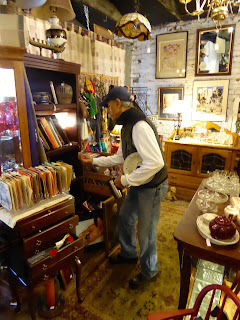 While there, do a little antiquing at The Livery across Maxwell Street. The Constitution was signed here. Nearby, a focal point of the city is the Town House, formerly known as Market House, before it was burned and rebuilt. 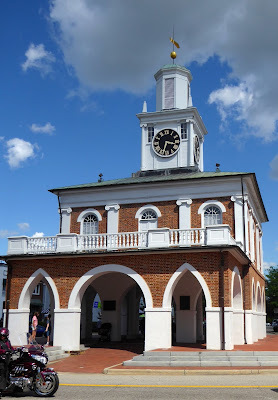 This is where North Carolina ratified the Constitution in 1789 and where Lafayette addressed in citizens during his visit in 1824, the 50th anniversary of the Declaration of Independence. 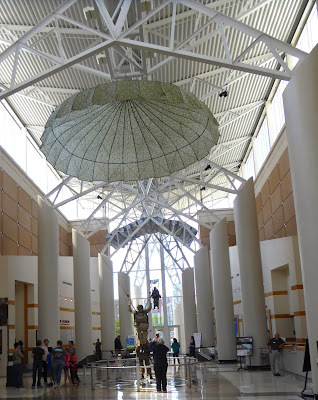 Airborne and Special Operations Museum. 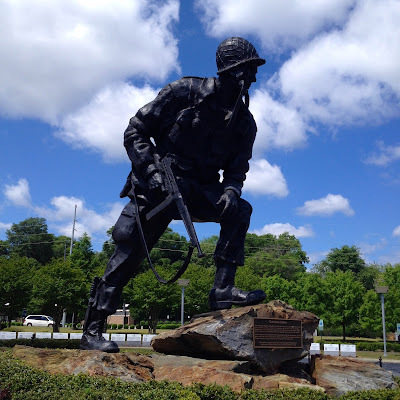 the only facility showing and telling the comprehensive history of the U.S. Army Airborne. Visiting it and the memorials and museums nearby will swell your admiration for our military and put more than a few lumps in your throat. "Iron Mike," everyone's favorite photo op site. Everything here has a meaning and a story we discovered during a tour from Paul Galloway, director of the foundation supporting the museum. The rocks around the "Iron Mike" statue outside are from Toccoa, GA, where the first airborne jump took place. Look for the family of rabbits that live there. 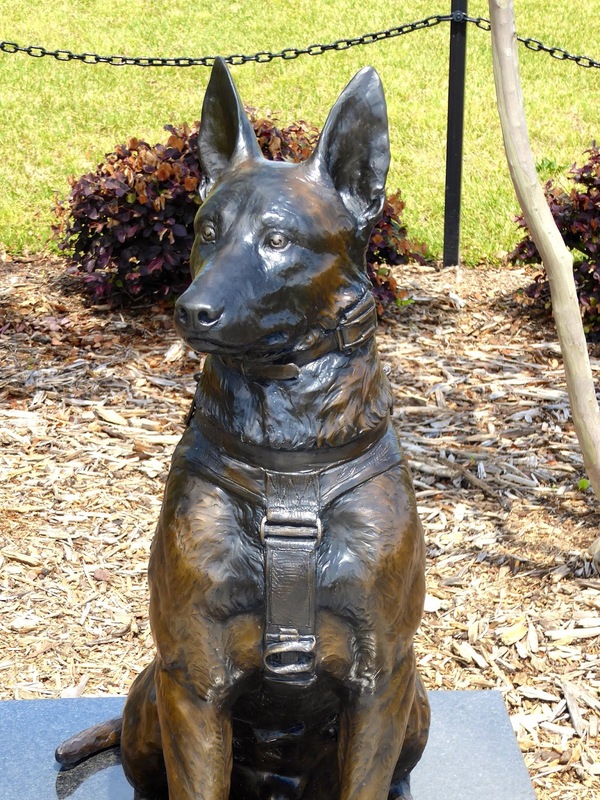 Everyone loves "Constant Vigilance," the bronze statue of a Belgian Malinoise, the world's only memorial to special operations canines killed in action. The facility itself opened August 18, 2006, anniversary of the test platoon, "the first fools to jump out of an aircraft." Inside, visitors find four full aircraft, a 509 Geronimo tank and hundreds of fascinating stories, including the true account of Black Hawk Down. Tip: Don't go without trying the Pritzker Simulator 5-minute 12-second glider ride and jump that takes you through war experiences from from France to the Euphrates River. Don't leave the area without strolling through the rose bushes to the North Carolina Veterans Park. 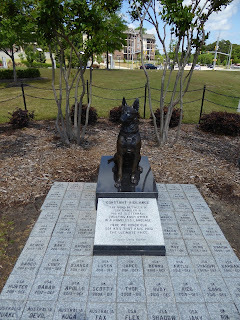 The memorials here are as engaging, creative and meaningful as any I have ever visited. 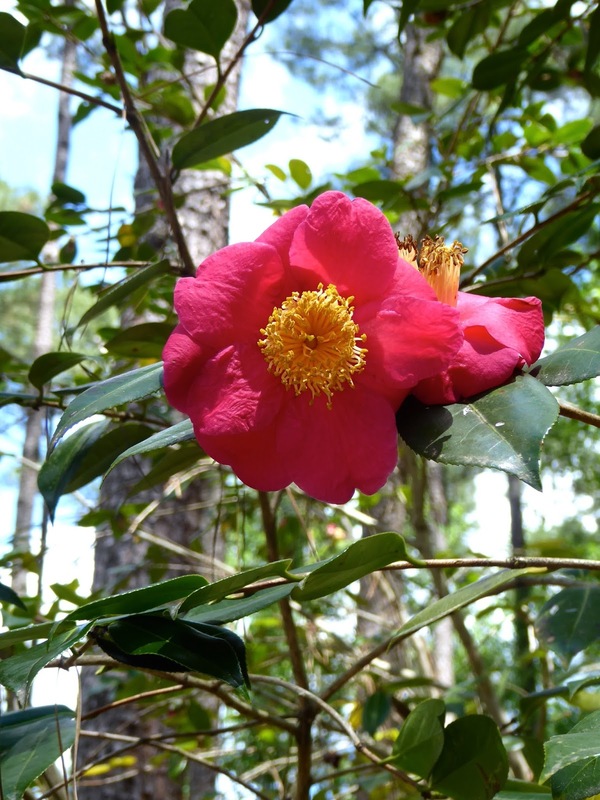 Horticulturists will want to stroll the 80-acre Cape Fear Botanical Garden, known for its native big leaf magnolias, yellow wood trees, loblolly pines and 175 different varieties of camellias blooming from 300 bushes. 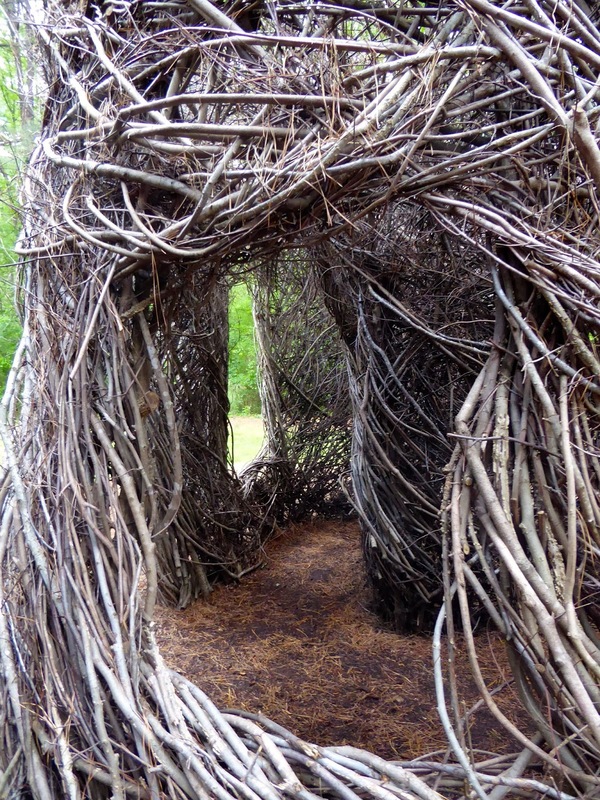 The garden also features a Patrick Doughetry stick work, "Just Beyond the Forest Curtain." Completed in June 2015, the sculptural environment was designed to decay which means visitors will have another year or two to enjoy it. If you are up for an active adventure, the program at ZipQuest is so outstanding that USA Today lists it as one of the top 10 in the country. Introduction and instruction is excellent. 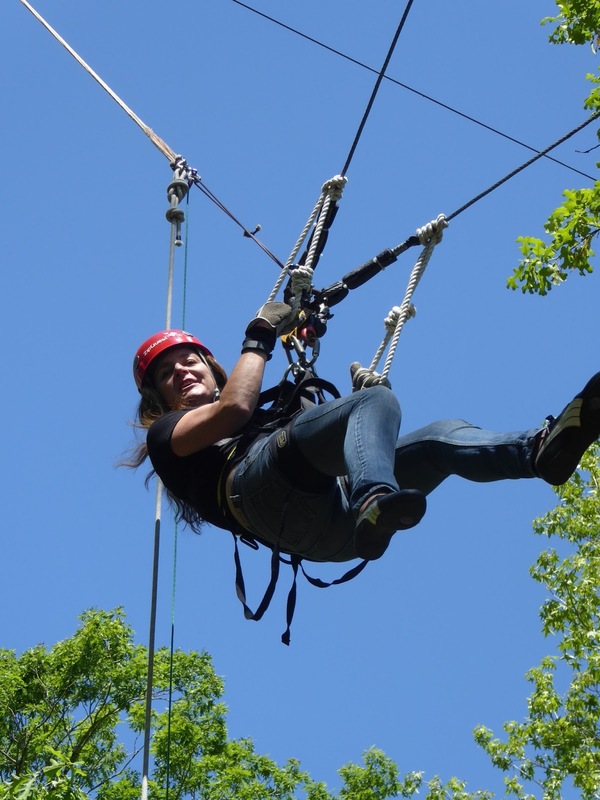 Tip: This is a 2-hour experience that includes 15 tree platforms and traversing four spiral staircases and three sky bridges. Hungry? 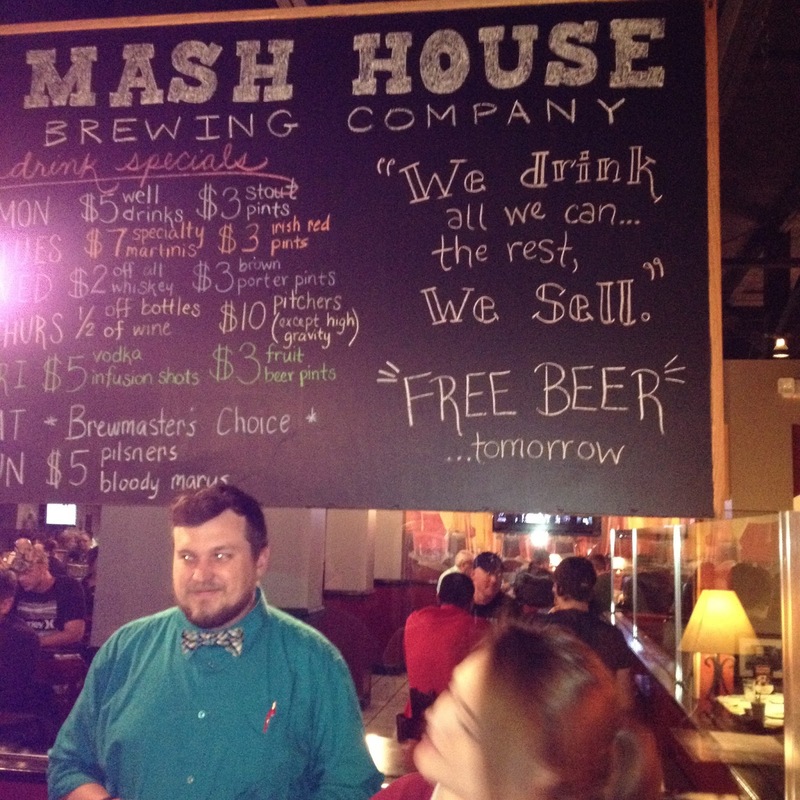 Beer lovers will appreciate The Mash House Brewing Company with its local quaffs and wood-fired oven fare. It's worth seeking out the New Deli Restaurant - it is hidden in a medical and office complex - for its pizza, paninis, creative grilled sandwiches and signature desserts. The Scrub Oaks Restaurant is a good choice for upscale comfort food in an attractive suburban setting.